Our poor away form came to a head on Tuesday evening when we lost 2-0 at Brackley to extend our lack of results on the road to just one point and one goal since early December. The manager John Eustace has stated that he's not worried about our away form but the fans are. The fans are very worried and wondering why the prospect of missing out on the play-offs completely, due to our poor away showings, and why the lack of a quality goalscorer is not being addressed considering that the recent Crowdfunder campaign was designed for such a reason. Don't forget that you only get three points if you score at least one goal. Now with the prospect of Elton N'Gwatala (right) out injured for at least three weeks, or more, we could be even more short of someone to put the ball into the net. It's obvious that a more robust answer is needed upfront with the recruitment of someone who is prepared to put his body on the line and get into the keepers face. We do it sometimes, usually in the final few minutes of a game that we are losing (see Chorley two weeks ago), but we don't do it half enough. Andre Brown is too lightweight for that rôle and Mani Dieseruvwe doesn't seem to get the service that allows him to do that. Meanwhile we see AFC Fylde taking steps yesterday to bring in players that will make sure the go over the line in the final days of the season. Tomorrow we're on the road again and a visit to FC Utd is the destination. They beat us earlier in the season with an own goal from Keith Lowe then adding a follow up goal later in the second half after we had battered them for ninety minutes without result. The keeper gained them the points that day but it also came on the heels of a string of high scoring wins for us when in the previous six games we had hammered in twenty five goals including two 6-0's. Apart from Elton we shouldn't have any other injuries to worry about but our hosts may have one. 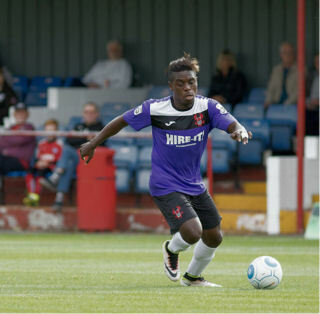 They signed Jordan Fagbola from Solihull in January but he hasn't featured much since signing due to an injury problem. It's not known what other injuries they have. Theirs has been a disappointing season after they were expected to be amongst the front runners throughout but at the moment they sit down in thirteenth place due to some inconsistent results. The do get the occasional win as at Gloucester last week but before that their previous win came at Altrincham on Boxing Day with their last home win way back on November 19th when they beat Nuneaton 3-0 at Broadhurst Park. So without a home win in three months we might stand a chance. Just need to score some goals then. Hornby, T Palmer, A Palmer, Ezewele, K Lowe, T Williams, Carter, Knights, Osborne, Evans, Thomas, Tunnicliffe, Francis-Angol, Croasdale, Gnahoua, Truslove, Austin, A Brown, McQuilkin, Taylor, Dieseruvwe, Waite. Basso, Carnell, Culkin, Forth, Frith, Ashworth, Baird, Chantler, Corbett, Tonge, J Williams, T Brown, Glynn, Hill, Jones, Kay, Kisimba, N Lowe, Sheridan, Thomson, Winter, Wright, Arnison, Gilchrist, Greaves, Pratt, Wolfenden, Fagbola.